What Is Hotel Organizational Structure? Because hotels vary in size and type, hotel organizational structure depends on the range of services and amenities offered to visiting guests. Some organizational structures include multiple departments, managers and branches to extend full-service luxury accommodations and amenities. However, small, low-budget, family run hotels may have only one manager and a few employees to handle all guest needs and services. All hotels divide their operations into two basic categories: administrative and guest operations. Administrative personnel handle the hotel's paperwork, accounting, human resources and office work responsibilities. Operations employees handle the general functions of the hotel. This includes checking in guests, coordinating events, cleaning rooms and maintenance duties. Both administrative and operations employees generally report to the hotel manager (general manager) and other managerial staff employees. The general manager oversees, and sometimes coordinates, all hotel major functions and makes sure the organization runs smoothly at all times. Administrative departments include human resources employees who hire and lay off staff; accountants, who handle invoices and paychecks; and front office employees who maintain the hotel's database of guests and service calls. The administrative side also includes sales, marketing and promotional managers who advertise the hotel and its services. What Is the Job Description of a Hotel Outlet Manager? The operations department includes employees who operate, coordinate and handle all guest needs in-person or behind the scenes. Operations employees include the front office workers who check in guests, maintenance crews, engineers, food and beverage staff, event coordinators and the managerial staff. A large, full-service hotel maintains an extensive organizational structure in order to quickly meet its guests’ needs and desires. The hotel utilizes a large management staff, including a general manager, a hiring manager, and managers of its catering, restaurant, housekeeping, sales and marketing departments. 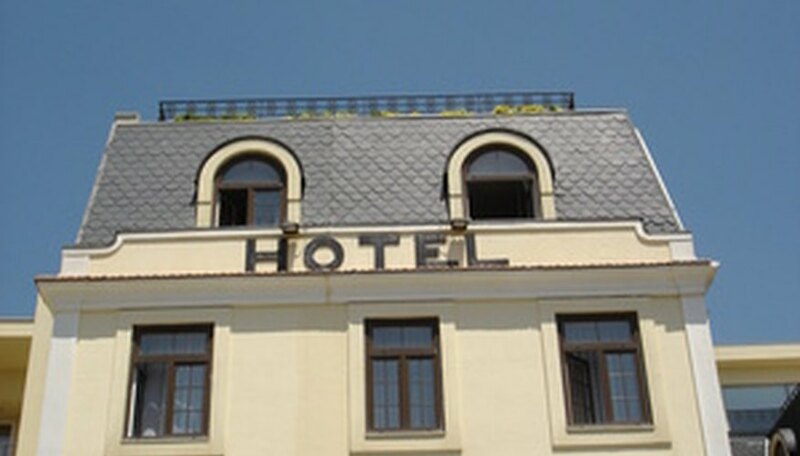 According to the United States Bureau of Labor Statistics 2010-2011 report on hotel organization, large hotel chains--recognizing the importance of expanded lodging options--are starting to offer limited-service, economy, and luxury inns under one corporate name. Limited service hotels--including boutique hotels, some bed and breakfasts, and budget (or economy) hotels--do not require the expansive organizational structure that a large-scale hotel requires. These smaller hotels operate with a smaller, more diversified staff. According to the U.S. Bureau of Labor Statistics report on hotel accommodations, patrons usually find smaller hotels in urban locations. Depending on an individual hotel’s rating, patrons often find high-quality service and distinctive decor and food selections due to tight staff and quality control measures. A hotel's organizational structure depends largely on the quality, competence and hierarchy of its staff. At the top of the hotel pyramid is the hotel's Chief Executive Officer (CEO). Underneath the CEO is the management staff, headed by the hotel general manager. The general manager, who oversees all hotel operations on a daily basis, may hire an assistant manager to help with his myriad duties and supervision. Underneath the general manager, a hotel may have a catering director, restaurant manager, wine manager, human resources director, administrative director, front office manager, etc. Underneath the managerial staff are the employees who work in food and beverage services, marketing and sales, room service, housekeeping and maintenance. The size of the hotel and the type of services it offers determines the complexity of its organizational employee structure. Lodging managers earned a median annual salary of $51,840 in 2016, according to the U.S. Bureau of Labor Statistics. On the low end, lodging managers earned a 25th percentile salary of $37,520, meaning 75 percent earned more than this amount. The 75th percentile salary is $70,540, meaning 25 percent earn more. In 2016, 47,800 people were employed in the U.S. as lodging managers. Noelle Carver has been a freelance writer since 2009, with work published in "SSYK" and "The Wolf," two U.K. literary journals. Carver holds a Bachelor of Arts in literature from American University and a Master of Fine Arts in writing from The New School. She lives in New York City.